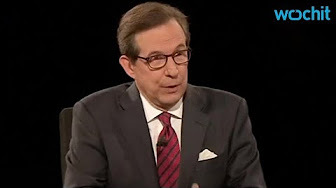 Noting Donald Trump's claims Wednesday night that the election was being rigged against him, Fox News' Chris Wallace asked the Republican whether he would accept the results win or lose, pointing out GOP vice presidential candidate Mike Pence had said that he would. When Trump answered that "we will look at it at the time," Wallace seemed incredulous. The veteran newsman stressed that a peaceful transition of power is one of the nation's longest traditions, no matter how tough the campaign. Wallace walked the finest of lines during a campaign where debate moderators received an intense focus. As the first-ever general election moderator of Fox News, he had the hopes of an organization in the midst of a tough year riding on him along with additional baggage. Fox critics worried that he'd go easy on Trump because of the GOP bent of Fox's primetime lineup. While Trump twice made it a point to thank Wallace for questions posed to Hillary Clinton — including the former secretary of state's claims in a leaked email about free trade — the Republican seemed visibly angry when the newsman tried to correct him on points made about Syria in a previous debate.